First dash cams came into police cruisers and now body cams on police officers are growing more popular. What’s next? Guns connected to the internet. As more technology invades US police departments, that’s what Yardarm is banking on. 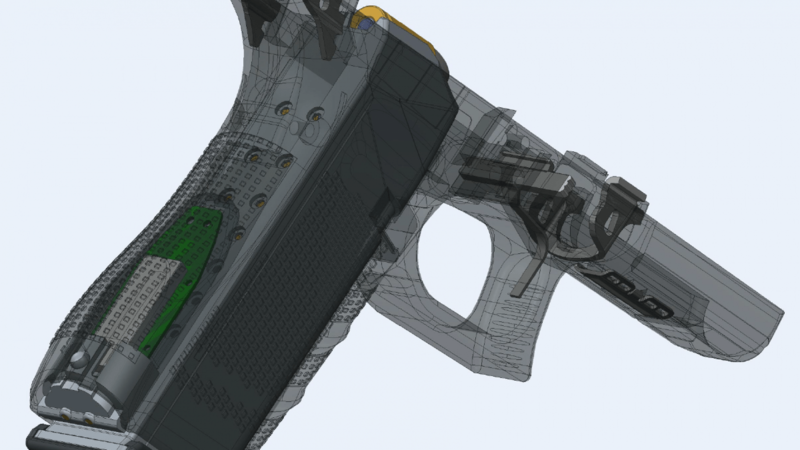 The 10-person Capitola, CA-based startup makes a tiny piece of hardware police officers snap into the back of their guns that contains an industrial-grade accelerometer and a magnetometer. The device is able to track the location of the gun, whether the gun is holstered or not, when it’s loaded and when it’s fired. The company is also working on being able to tell which direction the gun is pointed. All of this data coming off the sensors are connected to the police officer’s smarthphone via Bluetooth and that’s then being sent up to Yardarm’s servers. Once in the cloud, the information can be routed to the dispatcher’s software suite police departments have installed–companies such as Motorola, Intergraph and Harris make this kind of dispatcher software. Yardarm is also building a set of rules for how the data is used. For example, an alert could be sent off to the dispatcher if a police officer unholsters their gun while on a traffic stop, but to not send out an alert every time the officer unholsters the weapon as they may just be checking their weapon or going to the bathroom. It’s still early days for Yardarm. It has only two pilot programs it just set up at the Sheriff’s Department of Santa Cruz County in California and the Carrollton, Texas Police Department. But eventually, Yardarm is planning to make money through not only hardware unit sale but also through subscription fees sold through the dispatcher software providers. Yardarm is one of the many companies looking to benefit from the boom of money police departments are pouring into new technology using federal grant money. Some of this money is being used on creepy and ethically murky surveillance technology, while other money is being spent on keeping track of the officers as with body cams. Like dash cams or body cameras on officers, the Yardarm sensor could be used to collect more data with what’s happening while officers are on duty. It could help reconstruct what actually happened after an incident. But Yardarm is selling its device primarily as a police safety tool. Because Yardarm is designing its data to easily fit into dispatcher software, it could help dispatchers keep better tabs on all of its officers. The company has raised $1.5 million from family and friends so far to get to this current trial period. It’s going to have to raise more if it wants to start manufacturing higher volumes of its hardware and grow. But Schaff said venture capitalists get “jittery” whenever you start talking about firearms because it’s a controversial issue to wade into. Yardarm launched a year a half ago and the plan wasn’t initially to sell to police departments. At first, Yardarm wanted to sell into the consumer firearm market. The plan was to build technology into guns that would alert gun owners on their smartphone if their gun is stolen and then the owner could track its location. But that vision didn’t last long. Yardarm quickly changed plans when the company realized the political sensitivities in the consumer market would make developing the business a challenge. The company was also getting a lot of interest from police departments about adopting this technology when it first came out. It made sense the easier market to go after was in law enforcement. But Yardarm still has a lot to prove before it can get much further.